Approx. 1990: The princess puts on a tiara for some sort of royal function - and her short hair is combed well back so it doesn't cause a distraction. In fact, it could well be that the strands closest to the forehead are used to pin down the crown. Add some spray, and the look is royal and precise. JANUARY 1995: After her divorce, Diana displays a quite different look at an elegant evening. THe length is probably about the same, but the hair is slicked down for sleekness. Yet this is the princess's normal look at public appearances in that year -- with the appearance of layers, and bangs which probably are well-trimmed to stay out of her eyes. But the left-to-right combing makes you wonder how long the bangs would extend if they were straight. See our "Bangs Swept Away" article (linked below) for more about that. 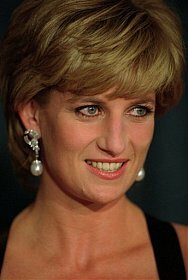 DECEMBER 1995: Diana records a famous TV interview about her relationships with Prince Charles and others. The hair is longer, and is capable of falling - but the layering on top is sprayed, and there are hints of the 1980's sizzle on her right side. HOW DID PRINCESS DIANA'S HAIR LOOK IN HER FINAL DAYS? © 2000-06 www.super-hair.net. All rights reserved.